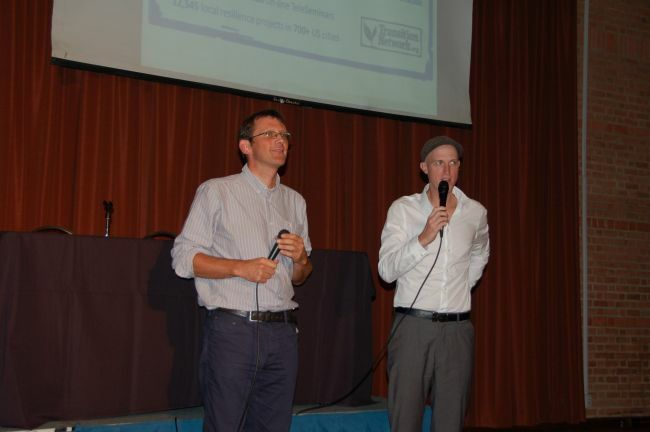 An interview with Jason Roberts: “If we are experiencing austerity, create visions”. Can you give us a sense of what Better Block is? Sure, Better Block takes, typically, blighted blocks but not always, in vacant, underused areas typically nestled inside a neighbourhood. We rapidly transform them with communities. So let’s say we’ve got a series of old buildings that are falling apart, lots of graffiti. We quickly go in there and create local businesses: local coffee shops, flower shops, art galleries, book shops, spaces for kids. Then we’ll take it out in the public space, the streets and transform them rapidly to allow for bike infrastructure and put out café seating to allow for a café seating experience. Then we go off and take the rules and the ordnances that won’t allow all these things to occur, because typically we’ve created all these rules. We print them off and show them in the street so that the community can actually see what’s holding the place back. 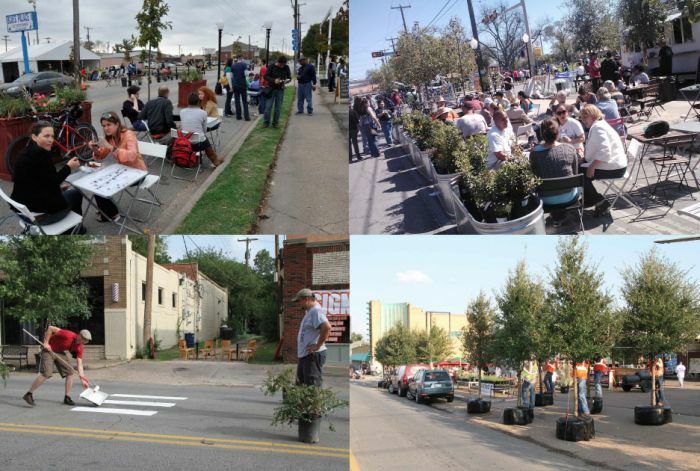 Really the project is kind of a combination of this urban planning exercise meets a block party. Where does the initial ‘pulse’ come from for the stuff that you do? Is it people in the place going, we’ve had enough of this, or is it that someone somewhere thinks this place needs a makeover? It’s both, actually. There’s that bottom-up with people from the community that come out and say, we need to have a neighbourhood destination, a place for us. But it’s also top-down in some cities. People are saying, we recognise that these areas are missing these things, and could you at least come and educate them on the value of these things. The beauty of the project is that it’s very bottom-up, and it allows the community to take ownership. It takes away this assumption that you’re going to manage and take care of this for me and puts it back onto the community. If we want these great places, we need them together, how can we create them together? What’s your experience in terms of the response from the communities where that happens? It’s been huge. At the very least, people see the images from the project and there’s definitely a visceral response, because changing a place from blight to beauty has a transformative effect. But really the big effect is getting everybody talking and connecting again. You probably get that with your work. That’s the stuff that we walk away from, and we come back six months later and wonder what’s changed. Maybe there haven’t been a whole lot of physical improvements, but it’s all of this social capital that’s been raised that you wouldn’t have had otherwise. When that works and that’s healthy, the natural by-product is the great stuff. You need to get down to the root cause of what’s causing these problems. At the very base root, whether it be in Dallas, Texas or London or Tehran, or Melbourne, where there have been Better Block projects, the lack of social connection the lack of social cohesiveness, and creating exercises and activities for the community to restitch themselves. When you go in with those ideas, there’s a lot of things you said happen when this arrives. It takes a resource to make that happen. Where does that resource come from? Do you get funded to do particular projects? We typically try to do it with as little money as possible. We like to show that if you want innovation, take a zero away from your budget, and if you want ultimate innovation take two zeros away from your project. I have this concept that you have to blackmail yourself. Give yourself a short deadline so you have to get these things done. But what happens when you strip away the funds? The neighbour typically says: “Hey, I’m Joe, I’ve been wanting to meet you. I’ve been looking for an excuse and I’m so glad we’re connecting right now, absolutely, let me give you some sugar”. So this dialogue occurs. Some trust occurs because they’re giving you something, you have these conversations. Then I go home and make the cookies and what do I do afterwards? What we’ll do here is we’ll share them with the neighbour afterwards. We say thank you for this. I found that by accident, borrowing and allowing people to give over things to help transform a space and to feel that they’re helping to improve it together and that they can enjoy it as a community is so powerful. Secondly, if we can’t borrow it, we build it together. Which is also a concept we talk about here in the States, a barn building exercise, which comes out of the Amish getting together and building barns together. It’s what you do when couples get married to help them become part of the community. That barn building exercise, working together creating physical activity to improve a place together, gets you to a deeper level of connectivity as a community. We know that when we start adding physical activity for some reason in a dialogue, it gets you deeper, faster. We’re having a conversation now, but if we were sitting here playing cards together or some other activity, we’re going to get some deeper, more interesting anecdotes that are going to tell me more of your story, and you’re going to hear more of my story and we’re going to get to an even better place. I don’t know what it is about that but we’ve found that that’s important. Lastly, if we have to, we buy things. But we try not to. We try to tell communities, this is really how you make a better place. All places have two major issues. The problem’s scale, the problem’s too big, and not enough money. How do you fix a problem whenever you have those two issues? It’s just a different way of problem solving. The first experience of it is the one you talk about in your TED talk. How did that give you confidence that this might work? The first one was in a little block in my community. My friends had started a little bike shop and it was zoned poorly. It was zoned as light industrial and not retail. I don’t know what that means, but the takeaway was that they were only allowed to have 10% of their space for retail, the rest had to be for service-oriented business. But they didn’t do that. They were a bike shop, 90% of the floor needed to be for retail and 10% for service. They broke the rules to make something that the community wanted. That made me realise – what other rules are there? I started cataloguing all the rules we put in place in this area and found that we weren’t allowed to do any of the stuff that makes the place great. Then when I asked people about it, they’d say that these rules had been in the book since 1941 and nobody knew why we were doing them. I’m also a musician, so I had a pretty strong arts community to pull from in my project. We thought, let’s all get together and treat this like a giant museum installation. We’re going to create a better block simply so we can live in our neighbourhood. Let’s put in all the resources we can so that we can live in our neighbourhood, so I don’t have to get in my car to get a gallon of milk … just simple ideas. This stuff is not complex. But when we started putting it out there, it was amazing how powerful people’s response was to transforming this space in their neighbourhood and making it into a shared neighbourhood destination. At that point a friend, as a little side project, made a 6 minute video and it went viral. That led to the TED presentation. 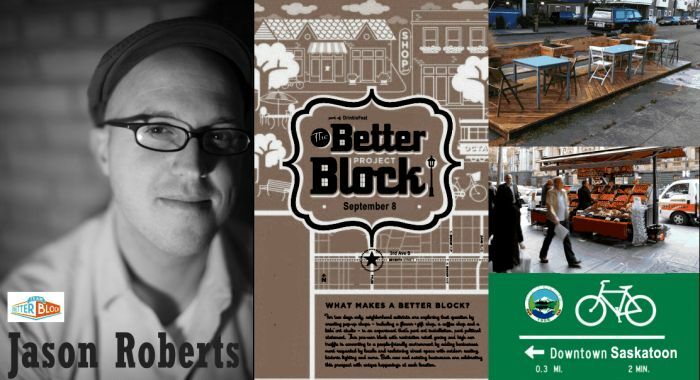 Better Block was actually one of about 10 projects I had put together for that week, and specifically trying to get people to think differently about our community, and do things. It accidentally became an international movement. It was not premeditated. I’ve just become friends with the guys at Rebar who started PARK(ing) Day and we were talking about our projects together. They open-sourced their project which became an international movement too, out of necessity because people asked them to come and do it there. They said that they didn’t have time but gave out a how-to. Ours is the same. People keep emailing me, asking how you do it. I just say here’s how you do it, do it yourself and tell us what you learn so we can share that information and create the best practices out of it. That first project was where it all started, with the community and people that I knew and loved, and said let’s work together to make this a better place. Out of necessity, I started to wish I had a bookshop, a café. We started discussions like how do we get a coffee shop for two days, what can we do. When you get 30 people in a room, someone says “well I can roast coffee beans”. “I’ve got a spare coffee pot that doesn’t get used”. “I’ve got a spare this…and does anybody have any spare seating, does anybody have any spare tables and chairs?” And someone says “yeah, in my garage, in my office. They just closed down a building over here, there are tons of tables and chairs”. When you start connecting all the dots you start realising all of the waste we create, this waste is basically things that we have that aren’t being put to use. We fill our houses and storage units with this stuff. Instead of it being waste, why don’t we make it a shared asset? One of the big contexts at the moment is the whole austerity push, the squeezing of public budgets and people feeling they have less and less and less control over the places around them as they start to unravel. What do you think are the main lessons from what you’ve learnt that really relate to communities that are suffering under austerity? A lot of this work came at a time when the economy was really depressed. There is really interesting innovation that can occur whenever you start taking these zeros away. I’ve got mixed emotions about it. You definitely want to take care of the most marginalised in your society who are super old, infirm, ill, or the young. How do we create environments that allow them to just live? If we are experiencing austerity, create visions. Let’s have a better place together, even when things start getting taken away. We still ultimately want to have a better place. There’s got to be a way. We all know that we get really creative when there’s something we want to have and we just don’t have the money. That’s the lesson, I think, from that. The last question – I mentioned that my recent book is called The Power of Just Doing Stuff. What, for you, is the power of just doing stuff? What is it when people take that step across and say “let’s do it” rather than just moaning about why nobody else is doing it? What is it that people find in themselves, what do they discover? I think that for me, I just wanted to have some accomplishments. I realised I was working for other people. I had a transformative moment when my grandfather was dying, he had a stroke and I remember him saying he didn’t do all the things he wanted to do in life. He said that over and over again. I remember thinking I don’t want to be like that. I need to get things done. I started doing all of these little projects, for my sake. I realised that when you start looking back, hey, I did a ton of stuff! I started Better Block, I brought a streetcar back, I created bike lane infrastructure, I ran for US congress, I had dinner with Michelle Obama, I got kids to cycle to school with punch card projects. Random little things. At the end of the day I feel that the short deadlines are important so you don’t talk yourself out of the things. Blackmailing yourself to publish it, put it out there so it puts you on the hook is so important. The analogy I use all the time is if my apartment is a mess, you get to a state where you can’t get anything done, it’s going to take me a week to get this thing knocked out, how can I clean this? Just call your friends and say you’re going to throw a dinner party in four hours. It’s amazing how clean your place gets and how efficient you get. All the distractions go away and you start making things happen. We actually work pretty well as human beings under these constraints. We all know it because when we have term papers due, we’ve got two weeks to do it but we get it done in the last 24 hours. We have the deadline and it’s short, and things happen. We have this mindset that the great things that happen in communities and society are because of someone’s inspiration – they have to sit around and drink coffee and think about what they’re going to do. The reality is you look at some of the great music that came out of the Tin Pan Alley area in the ’20s and ‘30s like Irving Berlin and Gershwin. Were they just sitting around drinking coffee thinking up ideas for songs? No! They had a deadline. A Broadway play came out that needs 12 songs. They needed to have great themes for all those songs, needed to get things done. At the end of the day though, you end up getting a catalogue of standards we have that we know we love, like oh, that was so inspired. It was actually probably George and Ira fighting with each other saying, “I’ve got to get this done, quick. This’ll do, we need a slow song in ¾ in a minor key, the girl has just left the guy”. When we create these boundaries and constraints, we can be ultimately creative with that out of necessity. And at the end you look back at the catalogue two or three years later and think yes, I’ve got some things done.